As we move closer to winter, we decided to refresh our sub-$200 audio interface article. We tweaked the content of our buyer’s guide, as well as added two new models well worth your attention – there’s our new chart leader, the Audient iD4, and the versatile Behringer U-PHORIA UMC404HD. Whatever level you are at in your production career, having an audio interface in your home studio is a must. It’s the easiest way to plug in a guitar and mic, and record music and vocals without spending a large amount of money on equipment. Having a good interface is even more important. In this article we are taking a look at the best audio interfaces you can find for under $200. We have put together a chart of our favorite models that cost less than two hundred bucks, as well as a brief buyer’s guide, to show you what you can expect from a good audio interface in this range. Let’s get started! An awesome example of versatility in the budget segment of the market. A very reliable interface that is all about pure performance and consistency. A proper workhorse that’s built like a tank and equally as capable. One of the older designs which has been updated and slightly modified. An interesting interface that combines some pretty unique features with good performance. The iD4 from British brand Audient is a new entry into this chart and – unsurprisingly, if you read the complete review – it heads straight to the top! The reason being the value for money on offer. With the iD4 it feels as if you are getting a high-end machine at this sub-$200 price. In some ways you are, as the Class A preamp in the iD4 features the same specs as used in Audient’s higher-end models. The I/O options and the controls are plentiful, allowing for a very versatile recording experience. The build quality is excellent too, and just adds to the quality on offer. Well worth checking out, whatever level you are at. If the two inputs featured on our chart-topping audio interface aren’t enough for your requirements, don’t worry – Behringer have you covered with their excellent UMC404HD. This simple but effective unit features not one, not two, but four combined TRS/XLR inputs on the front of the device, allowing you to connect up to four instruments or mics at the same time. This versatility is complemented by excellent controls and a solid performance, partly down to the included MIDAS preamps. For bands looking for extensive input options on a budget, it’s a worthy competitor. There’s more on this impressive audio interface in the complete Behringer U-PHORIA UMC404HD review. While Steinberg is a brand best-known for software, such as their impressive DAWs, they have made the plunge into the hardware side of things – and we’re glad they have! 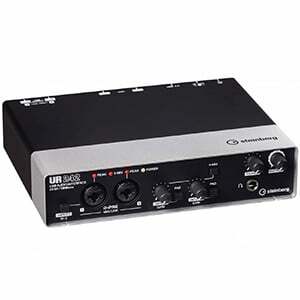 The USB-powered Steinberg UR242 represents an awesome audio interface that offers two versatile inputs, two excellent mic preamps, rock-solid performance and overall consistency (not to mention a good dose of their proprietary software, including a copy of Cubase AI and Cubasis LE). As we highlight in the complete Steinberg UR242 review, this retro-looking unit is a real workhorse of an audio interface that proves a reliable addition to any home studio. We move onto something a little different – in terms of aesthetics in particular. Such a cool retro-looking top-focused unit is a breath of fresh air in a market that’s full of interfaces that all look so similar. But this unit is more than just a pretty face. Combine the design with plenty of I/O options, solid functionality and performance – not to mention one of the best preamps in this price range – and the M-Track 2x2M is a stellar choice for any home studio. 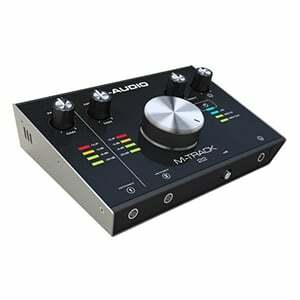 Be sure to read more about this cool audio interface in the full review of M-Audio’s M-Track 2x2M. Focusrite’s Scarlett Series of audio interfaces is impressive to say the least, with the 2i4 one of their mid-range models, aimed at home and small studios. It features a sturdy build and a bright red color scheme, which catches the eye and looks great wherever it sits on the desk. With two inputs, four outputs and full MIDI support, it’s also a very versatile piece of kit. As well as being a great performer, it’s also worth mentioning that the Scarlett 2i4 comes packed with a great software suite! 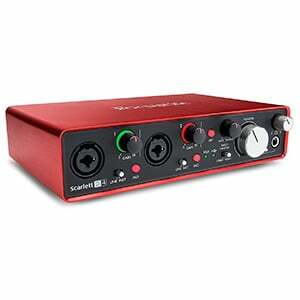 There’s more on the vibrant Focusrite Scarlett 2i4 in our complete review. We move onto another excellent audio interface from another popular brand. 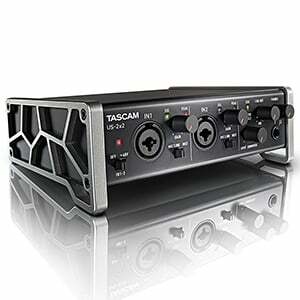 What we love about Tascam is their no-nonsense approach to designing these units. 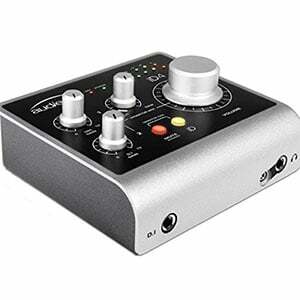 Just one look at the US-2x2 reveals that this is an audio interface that means business! It features a cool industrial design, with a sturdy chassis and robust diecast side panels that give it a slight upward angle. As we highlight in the full breakdown of the Tascam US-2x2, the brand has done a great job of creating a very functional, but ultimately logical interface that’s easy to use and highly consistent. 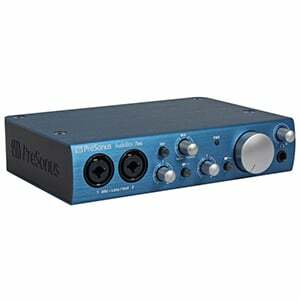 PreSonus’s line of USB-powered audio interfaces are among some of their most popular products. In particular, their AudioBox iTwo 2x2, which has been around for quite some time! During this time, it has established a very solid reputation for being a reliable, durable and consistent solution for home recording. It comes with two inputs, two outputs and gain controls for both channels, as well as a pair of MIDI ports round the back. While it comes with a lower sampling rate than others on this list, it’s a very reliable performer. Read more on this unit in the main review for the AudioBox iTwo 2x2. Hey… isn’t this an audio interface from Apple? It isn’t – but it’s clear iConnectivity were influenced by the giant tech brand when designing the iConnectAUDIO2+. This is mainly apparent due to the sleek, minimalist design of the unit itself, not to mention the classic ‘i’ prefix. However, it’s a solid piece of equipment in its own right. As we highlight in the full review of the iConnectAUDIO2+ the outputs in particular make it an extremely versatile interface. Everything else is pretty standard, with two combined XLR and TRS inputs, as well as full compatibility with both Windows and Mac. A good choice at this price. While the differences between budget audio interfaces (those under $100) and the sub-$200 models on this page may be very subtle, there certainly is a difference. This difference can mean a lot if you are serious about recording good music. One of the first improvements you will see in this segment of the market is connectivity. In most circumstances, cheaper interfaces will offer a basic selection of inputs and outputs. This usually translates to just one or two inputs, paired with a single output. As you move into the $200 range, this tends to change. Two inputs are standard while you will often see additional dedicated inputs for microphone and instrument lines (sometimes up to four). This is also the price range where you will find MIDI connections allowing you to easily connect MIDI keyboard controllers and other gear with no fuss. There will usually also be a slightly wider selection of output options. Some brands offer quad TRS outputs divided into stereo mode, some offer a complement of RCA outputs, while some offer both. Depending on how elaborate your recording rig is, having a variety of outputs can make a real difference. The quality of the vocals you record more or less depends on how good the microphone preamps in your interface are. The good news is that the preamps in units found in the $200 segment of the market are much more comparable to higher-end $500 audio interfaces than they are to $100 devices. From this, you are looking at a much higher level of sound quality as well as more transparency. Transparency can be explained as the ability of a preamp to have zero influence on the sound of a microphone. Whether or not completely transparent preamps exist is a topic of discussion for another day, but the preamps in the models on our chart offer a higher level of transparency compared to budget interfaces. One of the more underestimated aspects of shopping for an audio interface is the software that comes with the device. Needless to say, software and software integration is crucial if you want everything to run smoothly. Even the most affordable interfaces come with some kind of DAW. These are usually the most basic versions (sometimes demos, sometimes ‘lite’ versions) but they tend to get the job done, at least for new users. As you approach the $200 mark, that choice of software tends to become much more intricate. For starters, you get a very decent selection of DAWs in this range, while some models will come with more than one DAW (choice is good!). You will also find more supporting content that features a plethora of plug-ins, effects and other goodies to help you make good music. The benefits of this is that you won’t have to deal with integration and compatibility issues down the line. There we have it – you should now be more clued up on what a $200 audio interface can offer you and what some of the best models in this range are. Of course, there are many others available on the market so have a browse, but our chart represents the best of the best (in our opinion). Whatever you settle for, good luck with your new audio interface – may it lead to many years of happy recording!